Vision & Mission - Bangkok Terminal Logistics Co., Ltd. Efficiency: BTL will take care in every operation process and our objective is to perform the most efficiency and satisfaction to customers. Safety of product: All products should be delivered to receiver in good condition in every situation (No wet, no broken, no damage and no loss). Safety in traffic: To ensure a safe and comfortable journey, safety should be the first priority for all drivers in preventing road crashes. All drivers must strictly comply with traffic regulations especially alcohol and drug forbidden. Safety for environment: In order to ensure the highest safety and environmental driving standards at all times. Vehicle checks must be performed regularly to avoid emission deterioration by air pollution. Rapidly: All products should be delivered to receivers rapidly, no delay of truck arrival. Punctually: BTL recognizes the importance of meeting all of your time deadlines and we are firmly committed to providing time-critical. All trucks should be arrived to the destination on time and without any delay. In case of accident, BTL shall inform that cause to receiver immediately. Reasonable Price: Transportation cost is one of the most importance factors in every industry. BTL is aware that every amount of transportation cost is directly effect to selling price which is very significant to intense competition in the market. 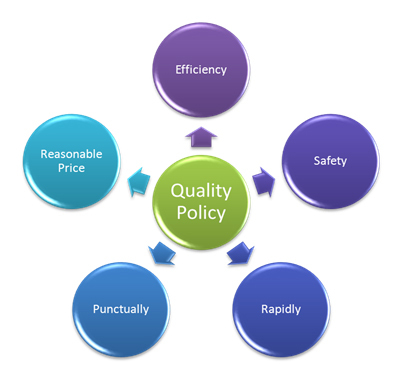 BTL certainly understands this point as we offers reasonable price to our customers. © 2013 Bangkok Terminal Logistics Co., Ltd. All rights reserved.